"I've never been a super strong runner, so returning to it after an 18-month hiatus feels a little like starting from scratch. My question is: When returning to running (or starting from scratch), do you think it's more helpful (mentally and physically) to focus on distance (setting weekly/monthly/whatever goals for how much distance covered with each run) or time (how much time spent out there with each run)?" I think Deb asks a great question. We're not experts, but in my own experience, I've had much more success focusing on time versus distance after breaks in my running. First, I think it'd be a good idea to do a "fitness trial" and see how much fitness you have retained during your time away from the sport. See how long you can comfortably run. Measure it in minutes. Depending on your previous mileage, set a workout time goal. Start by walking a few minutes to warm up. Then try and run as long as your comfortably can . . . then take a walk break to catch your breath . . . then run again . . . then walk until you hit a goal of time you'd like to exercise (not just run) that day. Walk/running is great for gaining stamina/endurance, and you may find that after a few weeks of walk/running, you're back to your old distances. If not, there's no shame. Just keep at it. 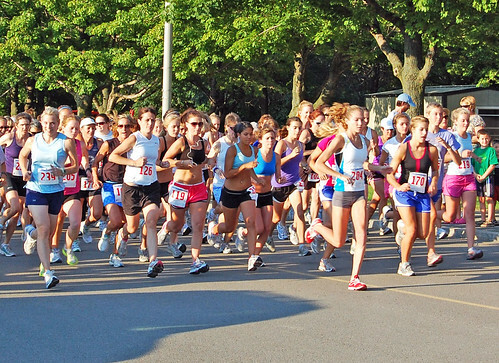 Marathon runners use the walk/run method to work up to their goal distance. The same is true of a 5K, 10K, or other shorter race. Then after a couple weeks of getting back into the swing of things, try to complete at least one workout per week where you run the entire time. Don't focus on speed, just time jogging. Eventually, you won't need the walking as much anymore. I promise! 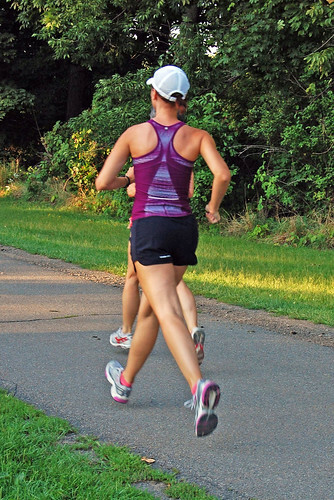 "After perusing your site for a while, I feel like everyone likes running. I'm writing to ask your advice on how not to absolutely loathe it (which I do. I wouldn't even call it running, I'd call it jogging . . . and I still hate it). I read that you, too, did not always love running (here's that story), and I want to know how long is it going to take before I leave the gym in a good mood and stop glaring at all of the fit people around me. Am i just impatient? I really want to stick with it and learn to love running!" Lindsey, your feelings are definitely not unique to you. And that's good news! So many of us -- whether we'll admit it or not -- struggled those first weeks, months, even years. Whether it was struggles (going from not fit to fit) or pain (injuries like shin splints) or motivation (I think we've all felt this one), there are a number of reasons you "hate" running right now. That being said: I love running. And there are several things that can help you learn to love it, too. Make a list of all the reasons you WANT to run. Does it seem like a good way to keep fit? Does it make you feel good when you're done? Etc. Now, if those reasons aren't really for YOU, you may want to consider exploring other physical activities, like biking or yoga. Running isn't for everyone, as much as blogs and magazines might make you think "everyone's" lacing up their sneaks. Print off a couch to 5K (or other training plan). Make it into a fun calendar. Post it to your refrigerator or in your bedroom. Cross off each workout you've completed with a colorful marker. With stickers. Seriously -- go all grade school on it. You'd be surprised by how something so simple can keep you motivated. And each time you cross off a run toward you goal, the feeling of accomplishment gives you an incredible high. Sign up for a race. Even if it scares the living crap out of you. A 5K is a good start. Try to make it a friend or family affair and recruit someone to train with you. Even if you can't find anyone to participate, I guarantee that the race experience will be helpful. You'll meet tons of other friendly runners who can offer advice. Oh, yeah. 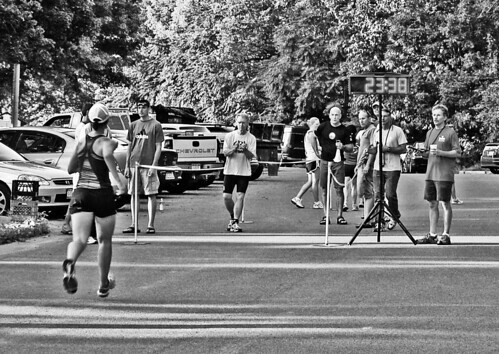 And there's no feeling like crossing a finish line -- speedy or not. Read Runners World. Compared to other fitness magazines, I feel Runners World has -- by far -- the most sound advice. They even have a section specifically for newbies. Every month, I really look forward to that extra dose of motivation. Read stories from other beginner (and once-beginner) self-made athletes. We have a ton on our new Fitspiration page. You'll be happy to find out that you're not alone in your struggles. We all have to start somewhere. However, while you're at it, don't compare yourself to others. This is a tricky one. But seriously -- your body is your body. I read stories of people who started running six months ago and are already on their way to a marathon. That DEFINITELY wasn't me. But look where I am now. If you're still struggling, don't worry. Like I wrote above -- running may just not be your thing. And that's more than OK. For example, to me it seems everyone is training for triathlons. I'm not a fan of swimming, never will be. Sometimes I feel discouraged reading about crazy brick workouts. But one day I asked myself -- in all honesty -- Is TRI training for you, Ashley? And the answer was a resounding no. I'm sticking to what feels right for me for now. Who knows -- someday my answer to that question might change. Do you have any advice to share with Deb or Lindsey? If so, please share! And if you have a question about your own running or training, just leave a comment or email us at neverhomemaker [at] gmail [dot] com. We'd be happy to help -- maybe even feature your question on the site!